You all remember high school graduation and the slow procession of students marching to receive their diplomas. Well, the Kahuku High School seniors in Hawaii just blew your graduation ceremony out of the water! Setting a new standard for graduation performances, the teens put together a choreographed medley of popular songs, including, “Wrecking Ball,” “Uptown Funk,” and “Shake It Off.” They switched up some of the lyrics to reflect graduation. According to the YouTube user who posted the video, the graduating seniors learned the routine in just two days! The performance ends with the school’s very own ceremonial war dance. The graduation performance has gone viral, with over 1.2 million views since it was posted Saturday. 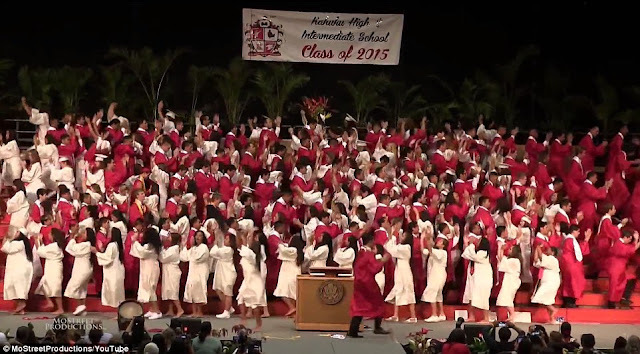 Congratulations Kahuku High School Class of 2015.